Let me give you the general idea before I get into specifics. There are two colours. You start with a row consisting of the colours chosen in a random order. Then in subsequent rows, the colour of a stitch depends on the colours of the three stitches below it. (That is, the one directly below and the ones either side of that stitch.) If you’re at an edge stitch, you need to look at the stitches at the other end of the row – imagine they wrap around in a circle. The specific rule I chose is the following. 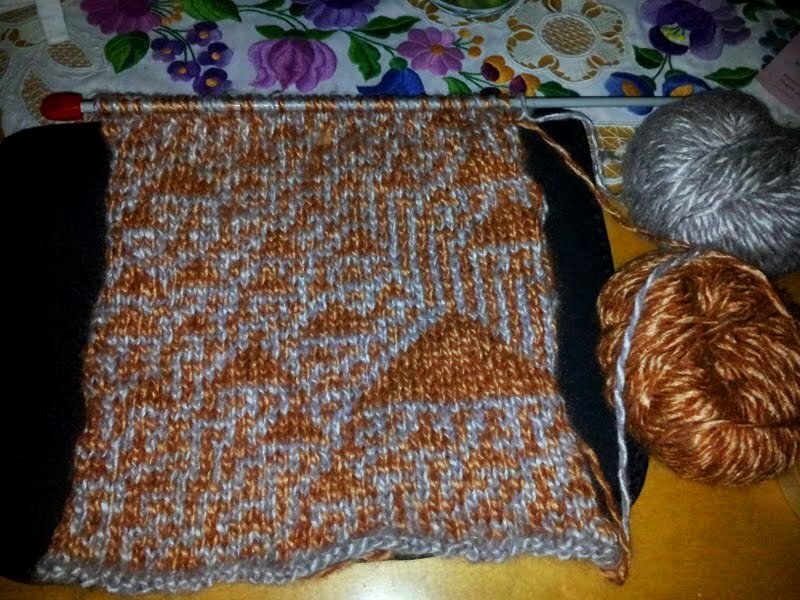 Let W=white yarn, O=orange yarn. This is called ‘Rule 30’ and you can read more about it on Wikipedia.Not all rules are chaotic, but this one is. If you change the colour of even just one stitch in the starting row, you’ll get a completely different pattern. The first thing you’ll notice is all the triangles that appear. That was unexpected. There are also some straight lines on the right. But it’s all very random. This way of creating patterns is known mathematically as a “one dimensional binary cellular automaton”. It is one-dimensional because it only relies on the stitches immediately below it, and not all the other ones around it. Wikipedia has a lot of information about more general cellular automata if you are interested! One of the amazing things about Rule 30 is that it appears in nature too. 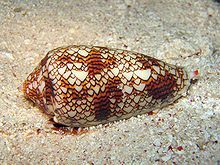 There is a particular species of sea snail, called Conus textile, which shows up a very similar pattern on its shell. Notice the triangles appearing as well as regions of straight lines. Amazing! Categories: patterns and instructions | Permalink. The Botanica Mathematica project is about using simple mathematical rules to generate pieces of knitting or crochet. If the rule involves choosing what to do based on what you have already done, then you will be making an L-system. Madeleine has already written a post with a simple example, and in this post I want to elaborate on it some more. Categories: patterns and instructions | Tags: Fibonacci, L-system | Permalink. Botanica Mathematica on the web!